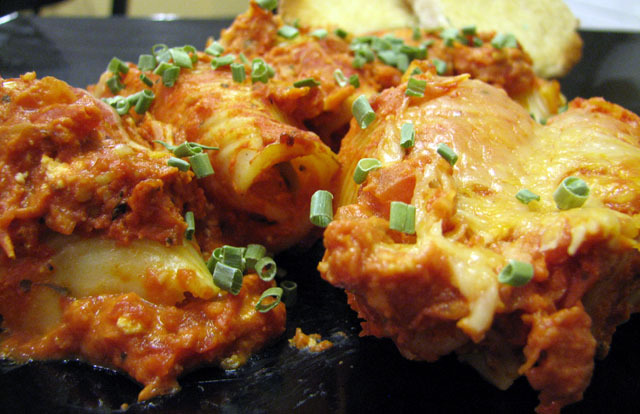 This recipe is one that I adapted from a locally owned restaurant close to where we live called Joe’s Italian. It’s an insanely popular place to eat and stays packed out. They have a small menu, but they use superior ingredients and everything there is amazing. This was a special they had a few weeks ago and I was finally able to convince my daughter to eat something besides cheese pizza – and she loved it. So I told her I would make a version for her at home. Preheat oven to 350. Prepare the shells according to package directions, drain and set aside. 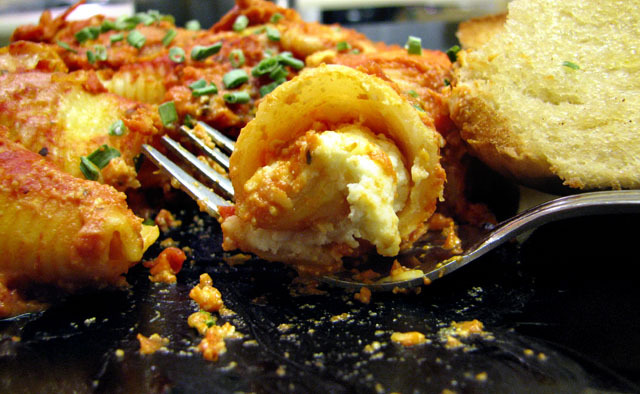 In a medium mixing bowl, combine the Ricotta, Mozzarella and Parmesan; refrigerate until ready to stuff the shells. Bring about 2 tbsp olive oil to medium-high heat in a large saute pan, add the garlic. Cook for about 30 seconds, stirring; then add the tomatoes through salt. Bring to a slow boil, reduce heat to medium and cover, stirring every couple of minutes. Simmer for 10 minutes, then stir in the cream cheese. Simmer, covered, until the cream cheese is fully incorporated into the sauce. Taste and adjust for salt and pepper if you need to and remove from heat. 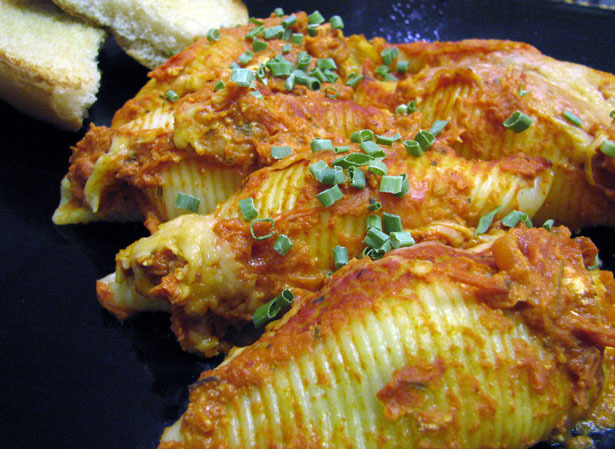 Begin by stuffing the shells with the cheese mixture, arranging in a single layer in a 9×11 baking dish. Pour the sauce over the shells and sprinkle with the Mozzarella. Cover with foil and bake for 35 minutes. Uncover and bake an additional 5-10 minutes, or until the cheese is melted and the sauce is bubbling. Your belly called. It said for you to make this. *I decided next time I’m going to add more tomatoes because I could have used more sauce, but if you don’t like things too “saucy” then this would be just right. If you decide to add more, remember to increase the cream cheese. This entry was posted in Basil, Cheese, Cooking, Cream Cheese, Cuisine, Dinner, Eating, Food, Garlic, Herbs & Spices, Italian, Italian Cuisine, Mozzarella, Oregano, Parmesean, Pasta, Pasta Shells, Pepper, Recipes, Red Wine Vinegar, Ricotta Cheese, Salt, Sauces & Marinades, Tomatoes, Vegetables. Bookmark the permalink.